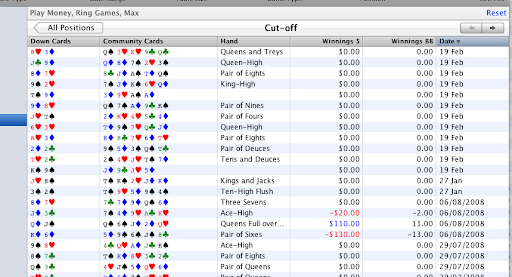 The new filters (poker room, hand type, advanced) are applied throughout. I intend to add this to the Tournament Summary, Hand Type Summary, Player Summary, Stake Level Summary, and Position Summary. If the approach I’ve taken looks familiar, it’s because I borrowed heavily from iTunes.